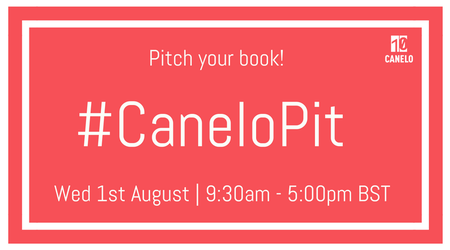 On Wednesday 1st August, from 9:30am to 5pm BST, the Canelo editorial team will be running its first pitch event on Twitter under the hashtag #CaneloPit. From 9:30am writers are invited to pitch their novels via Twitter to our editorial team for potential representation and guaranteed feedback. You do not need to have a complete manuscript to pitch your story to us – but you must have the first three chapters ready for review and an outline of where the story will go from there. Please do not pitch a book that has previously been passed on by Canelo. We will consider self-published books and books that have previously been published professionally where rights are now available, as well as submissions from unpublished writers. You may pitch more than one book during the event but you cannot pitch the same book more than once. Editors will be monitoring the hashtag from 9:30am to 5pm (BST) and if they like the sound of a pitch they will ‘like’ the post. This is the author’s invitation to submit the project for review and feedback (more information below). You do not need to include the editor’s Twitter handle in your pitch as they will all be monitoring the #CaneloPit hashtag and will like the pitches most suited to their tastes. What to do if your pitch is liked? If your pitch is liked we ask that you send either the first three chapters – or preferably the complete manuscript – with a synopsis as attachments and a covering letter in the body of the email, to submissions@canelo.co by the 6th August. Covering letters should include: where you see your book in the market and the authors you see your work sitting alongside. All requested pitches will receive a response with editorial feedback by 31st August 2018.